Our new and returning board members with Dr. Henningsen, front row, Dr. Robert Winsler and Avis Craig; back row, Bobby Durrance and Bill Edgar. Welcome to spring semester. New semester, new board members, new strategic plan. 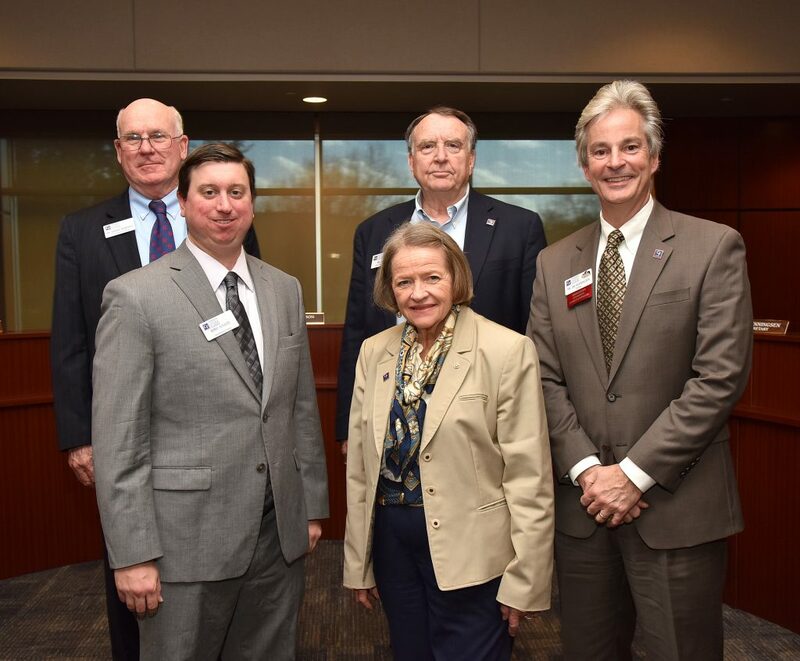 At our District Board of Trustees meeting last Wednesday, we welcomed two new board members and welcomed back Bobby Durrance and Bill Edgar, who have been reappointed. The appointments were made by Rick Scott during his final week as governor and have been retracted by Gov. Ron DeSantis, who has said the individuals will be afforded every consideration as the application process re-opens. Based on input from the College’s General Counsel, they will continue to serve until Governor DeSantis makes a decision on new appointments. Dr. Robert Winsler, from Crystal River, is the president of Winsler Consulting and Advocacy LLC and is an adjunct professor at the University of Tampa. 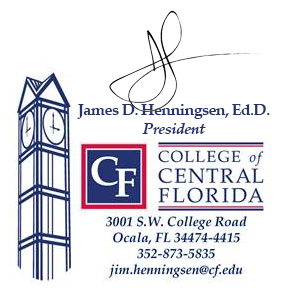 He received his bachelor’s degree from the University of Tampa, master’s degree from the University of South Florida, and doctorate from the University of Florida. Dr. Winsler succeeds Don Taylor and his term ends in May 2019. I am pleased to share that the board approved our 2019-2024 Strategic Plan, Fully Focused on Student Success. The plan was crafted with wide input from across the college and community and includes three strategic priorities: Investing in Our Students, Investing in Our Community and Investing in Our Team. This plan unfolds at a time when it is more urgent than ever that we reinforce the value of higher education to improve long-term socioeconomic outcomes for all. Our three strategic priorities drive our focus toward the interconnectedness of our students, community and team. This is the heart of our transformation strategy — to leverage the unique strengths within and across these areas in the service of student success. We can be proud of the plan, which is a living, breathing document that will be referenced regularly. Thank you to everyone that participated in this year-long process to craft a strategic direction for the next five years! This morning, I held our senior staff meeting at the Citrus Campus. At the opening of the meeting, we met with Citrus Campus student leaders and discussed college successes and areas of opportunity. I was so impressed with how prepared and engaged the students were with the whole team! They are great reflections of the quality of work all of you do transforming lives at CF! Our CF Family Campaign is underway and I ask for your support in helping us to reach 100 percent employee participation. Last year we made great strides and reached 92 percent. Our Reaching Higher Campaign priorities are Scholarships, Health Sciences, Equine/Agribusiness and the Appleton Museum. You can also support endowed chairs/faculty grants, greatest need, the CF Patriot Fund, Promise for the Future Fund/New Program Development and more. Donor forms are available from your department representative, at Inside CF or by calling Elvie Tyler, coordinator Annual Fund and Alumni Relations at ext. 1726. Thanks for your role in transforming lives. Together we are making a huge difference in our communities!